You probably know a thing or two about search engine optimization (SEO). You’ve also surely read quite a few blog posts right here about the basics of SEO. 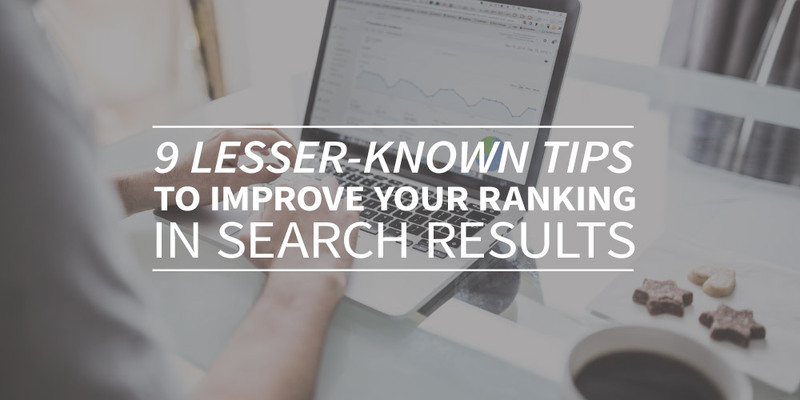 For example, how to use keyword research to identify relevant search terms or how your blog’s readability can help you achieve a higher ranking. It’s very likely that your competition has also mastered those SEO basics. That means it’s time to step up your game! In this article, you’ll discover some lesser-known SEO tips that will help you make a notable difference. We’ll share both direct remedies to improve your search ranking, as well as tips to increase reading time or click-through rates (CTR), which will both affect your Google ranking. SEO has evolved a lot over the past years. In the early days you could simply get away with the strategic placement of keywords, whereas now, Google’s machine-learning artificial intelligence algorithms (like RankBrain) will look at your website the same way a human would. A solid article is always the best place to start. Write your content in a way that’s enjoyable to read. Don’t make any concessions, like oddly structured sentences or unnecessary keyword additions that would make your blog post or product page harder to read. The internet is becoming more and more visual. Google takes that into account in search results. That means that a blog with lots of (relevant) images, videos, and infographics will score higher in search rankings. Infographics come with an additional advantage: they are often shared by other websites. That leads to valuable inbound links, which will help with your ranking. Tools like Canva and Design Pickle provide easy and user-friendly ways to create your own infographics. Outbound links can also help you earn a higher ranking in search results, although that process is far from perfect. The goal is to find a balance between being of service to your visitors and extending their session duration on your site. That’s why it’s best to link to qualitative sources with a high page authority and/or domain authority. Both Google and your visitors will appreciate it. link to an official government service page. simply linking to a company’s general homepage. Of course, you’ve read about the importance of internal links before. They help guide visitors through your website and allow Google to better understand your site structure. Beware, though, of ‘internal link spam.’ Basically that means linking as many keywords as possible to your own landing pages. In short blog posts (up to 400 words), aim for a maximum of three internal links. Avoid more than five links in longer posts. And be sure to switch up the wording of your internal links to keep things interesting. Once in a while, a mention of your company name, product, or service will pop up on external websites. But not every mention contains a link. That’s a shame since these potential backlinks have the power to drive more direct visitors, as well as a better position in search results. In these cases, it’s perfectly fair to ask those website owners to include a link to your website. Not everyone will agree to do so (traditional journalistic media are wary of this practice), but many will be happy to help. #6 You deserve this super effective tip about SEO titles! A blog title or page title is where you include your most important keywords. That is a well-known guideline in the basics of search engine optimization. But once you’ve done that – for example, ‘SEO titles’ – it’s still smart to tinker with the title a bit more. CoSchedule research suggests that articles with an emotional title get shared much more often than those with more neutral phrasing. People also click on those titles more often from their search results (CTR). That sends the message to Google that those articles hold value, provided they’re not just clickbait, and the visitor sticks around for a while. Of course, you need to keep your target audience in mind. An intellectual audience will be turned off by superlatives more than the average person would. When in doubt about the right level of emotion in a title (for example ‘you have earned’ versus ‘this will change your life’), you can try running some A/B tests. Using words in brackets to clarify a title can also have a positive impact on click-through ratio. You can also use it to point out multimedia content: [podcast]/ /[infographic]. It’s a positive way to stand out in a list of search results that (seem to) exclusively consist of text content. Aside from emotion and brackets, adding numbers to your titles is also a great move. Oddly enough, odd numbers seem to perform better than even numbers. That’s why you’ll see more ‘7 tips’ articles, rather than equivalent blog posts with 4 or 6 in the title. In this article, we shared some smart SEO-hacks which can make a huge difference in search result ranking. Applying these tips in a smart way does take some time and practice. It also requires human input: today’s artificial intelligence is not quite at the level of creating a title catered to a specific audience and with a specific purpose. Much of the work of search engine optimization can be left to smart online solutions. Webtexttool will offer you real-time tips while you write, covering everything from your writing style to the frequency of keywords and the way you structure your article.